This topic will explain the revision status box and the different revision indications you will see and their explanation. The Chart Revision Status box displays the timeliness of the chart information available on the device. This is accessed through the Revision Status icon opening the “Available Updates” page. 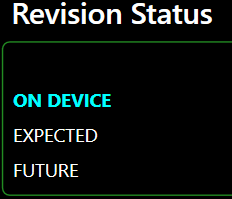 Click the Revision Status Box image. To start with, you need to make sure that available updates tab is highlighted. The status box is split into two different products, the Enroute section and the Charts & Guide section. Each of these will have revision dates corresponding to what is currently on the device, what is expected and the future dates. Let's have a look at these in more detail. ON DEVICE: This indicates the map revision that is currently deployed and available on the device. EXPECTED: This indicates the map revision that is currently effective (based on the device time and date settings) and is required to operate Charts+. FUTURE: This indicates the map revision that will become effective after the current map revision. ON DEVICE: This indicates the chart revision that is currently deployed and available in the departure, alternate and arrival workspaces. EXPECTED: This indicates the chart revision that is currently effective (based on the device time and date settings) and is required to operate Charts+. FUTURE: This indicates the chart revision that will become effective after the current chart revision. If the ON DEVICE Enroute and/or Charts and Guide revision loaded matches the EXPECTED Enroute or Charts and Guide revision, the ON DEVICE revision text is light Blue and the EXPECTED revision dates text is Green. The FUTURE Enroute or Charts and Guides revision text is always White. 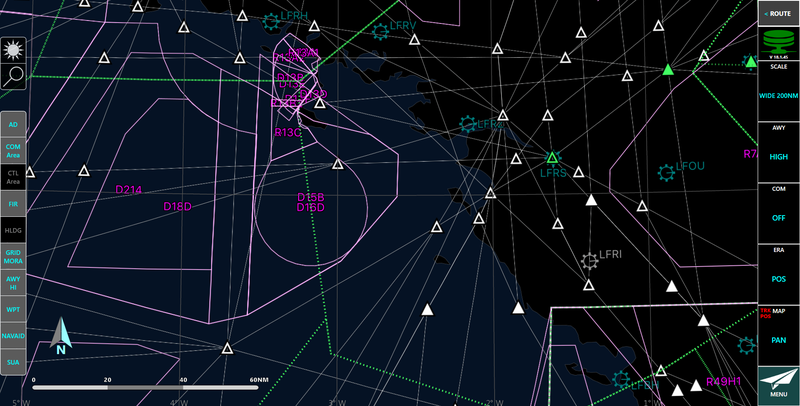 The green border around the Revision Status indicates that the ENROUTE and CHARTS & GUIDE data is up to date as user interacts with Enroute and Charts. If the ON DEVICE Enroute or Charts and Guides revision does not match the EXPECTED Enroute or Charts and Guide revision, the ON DEVICE revision text is light Blue, and the EXPECTED revision text is Red. The FUTURE Enroute or Charts and Guides revision text is always White. The red border around the Revision Status indicates that either ENROUTE and CHARTS & GUIDE data is OUT OF DATE as user interacts with Enroute and Charts. Action should be taken to download the latest update package to get the data up-to-date (for flight regulation concern) or contact your administrator if no such update package exists. While the active Charts and Guides revision does not match the current Charts and Guides revision, you will see a message (shown above) stating that the active does not match the current revision on the arrival, departure and alternate workspaces as well as the document and clipboard workspaces. The equivalent warning exists as well for the Enroute data.